The Charlotte 49ers have completed their 2009-10 men’s basketball recruiting class, landing Turkish national Gokhan (pronounced GO-kin) Sirin, a 6-foot-9, 201 pound forward with a soft shooting touch. Sirin picked the 49ers Friday over Georgetown, Loyola (Md.) and South Florida, his high school coach, Dave Tallman, said. 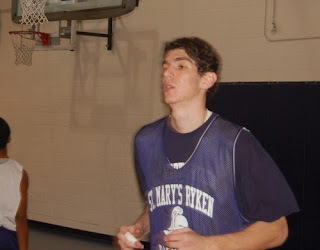 ESPN.com ranks Sirin the 62nd best power forward in the country in the class of 2009. Sirin arrived in the United States last August and enrolled at St. Mary’s Ryken High School in Leonardtown, Md. He quickly established himself as a scorer and averaged 17 points a game this season for the Knights. St. Mary’s Ryken plays in the competitive Washington Catholic Athletic Conference, which features prep powerhouse programs like Bishop McNamara, DeMatha and Gonzaga (D.C.). Soon after his only high school season in the U.S. began, Sirin was attracting scholarship offers from Division I programs, Tallman said. hopefully a great finish to a the 2009-10 class for the Niners. Welcome to Charlotte, Gokan! Congratulations 49ers. I went to school this year with Gokhan and he is a wonderful person and player. He is one of the most skilled players I have seen. He can shoot the lights out of the basket and can fill it up from all over the floor. He had several Big East schools after him, more than mentioned in this article. You will find him a huge contributor over his 4 years. I look forward to seeing this Gokhan in action! Welcome to Charlotte!! A great finish to a top notch recruiting class. Maybe the yearly trips to the NCAA will return for the Niners. And this is why having Moxley back on our bench pays dividends! !